If you are planning a trip to Canada, you may worry about your travel budget since Canada isn’t exactly known as a cheap destination. 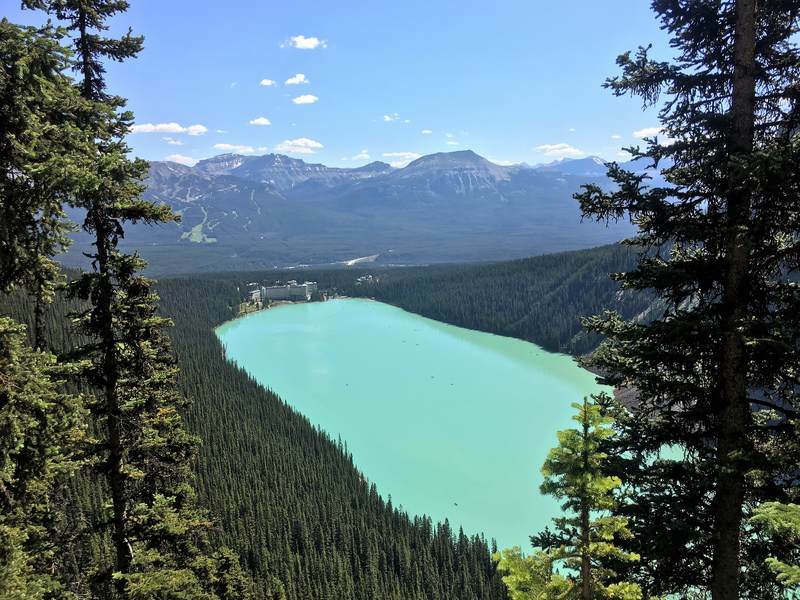 But don’t despair, I wrote this post to show you exactly how much we spent on our Canada road trip and how to save money when traveling to Canada. Canada is the country we spent most of our time during our one year RTW trip. For two and a half months we explored this beautiful part of the world. We spent 2 weeks on Vancouver Island, went sightseeing in Vancouver, drove the Sea to Sky highway, marveled at the amazing parks in Alberta, hiked around the badlands in Drumheller, crossed the prairie of Saskatchewan, spent a weekend in Winnipeg and toured around Ontario. Those who read this blog more often know that road trips are our favorite way to travel. 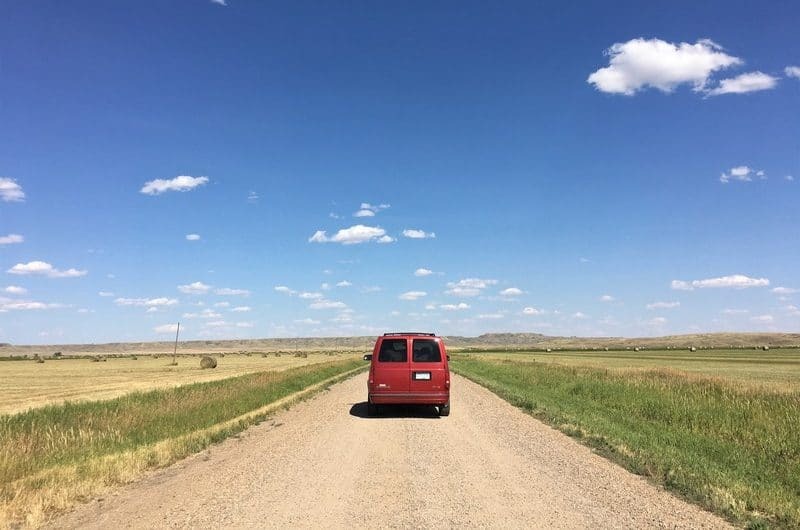 And I can say from experience that road tripping is not just one of the best, but also one of the cheapest ways to travel! 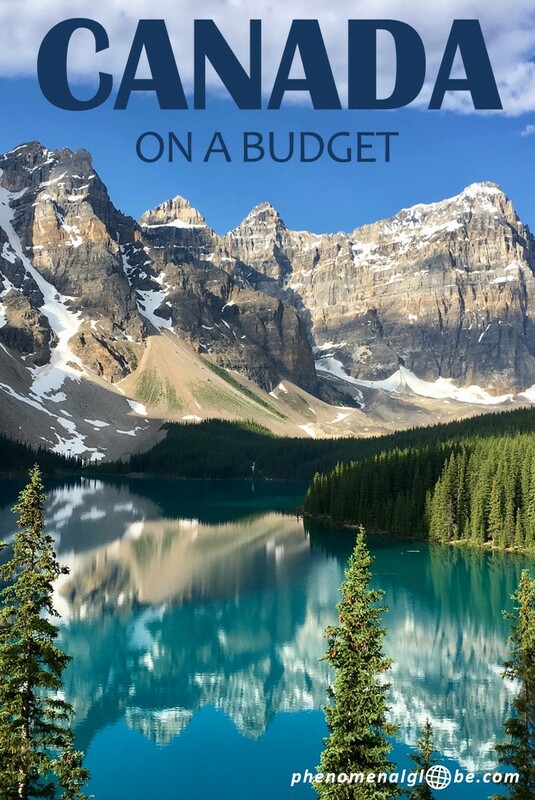 Keep reading to learn how much we spent during our Canada road trip and for tips how to visit Canada on a budget. 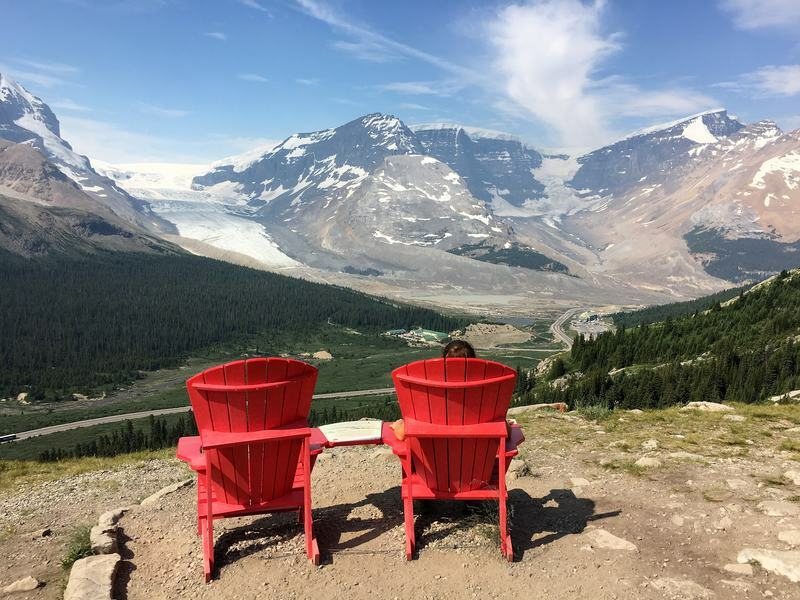 Our Canada travel budget: how much did we spend on an average day in Canada? Traveling Canada by camper van: how much does it cost? 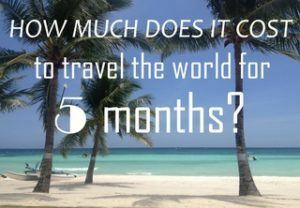 How much does it cost to travel Canada? Curious how much our average daily travel budget in Canada was? 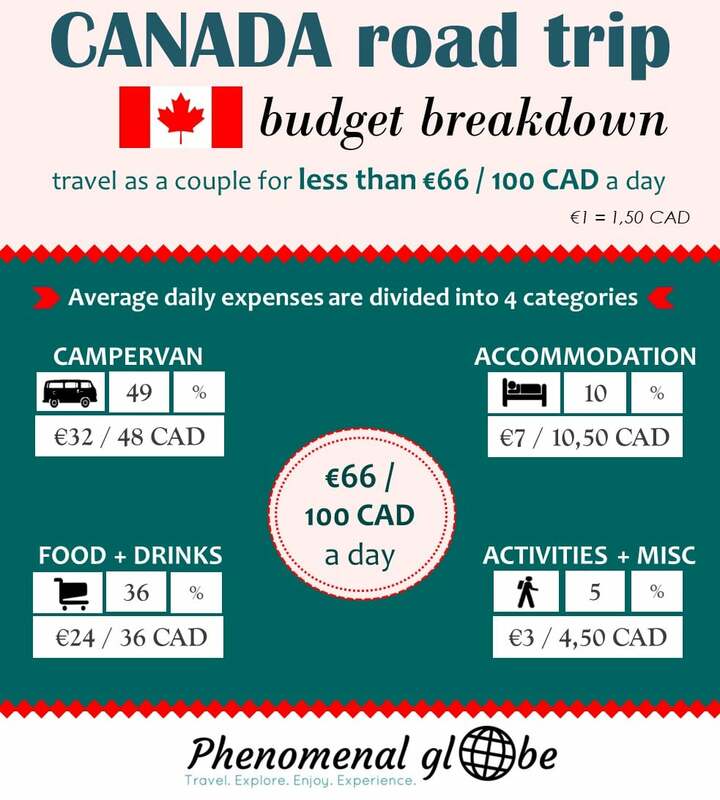 During our cross-Canada road trip we spent around €66/100 CAD per day as a couple! 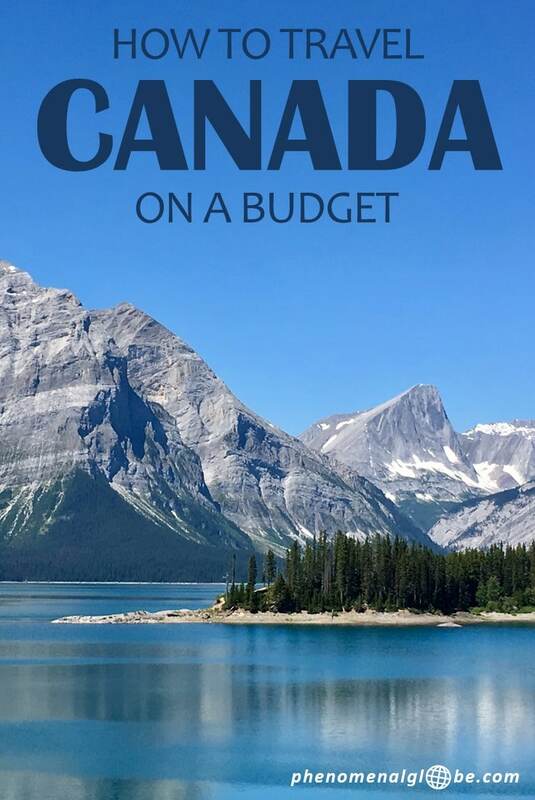 In the infographic you can find our complete Canada budget breakdown and how much we paid for our campervan, accommodation, food and drinks, activities and miscellaneous expenses. • I traveled Canada with my husband, all expenses are for the two of us together. • I quote prices in € and Canadian Dollar (CAD). We traveled Canada in the Summer of 2017, the exchange rate at that time was €1 = 1,50 AUD. Of course the exchange rate varies, so this may be different now. • We spent 2,5 months in Canada, on an average day we spent €66/100 CAD. • Our average daily travel budget includes all our travel costs in Canada, it does not include the costs for our tickets to Canada. • My Canada road trip trip started and ended in Vancouver, where we bought our trusted GMC Safari VANessa. I’ll post our itinerary on the blog as soon as possible. 1. 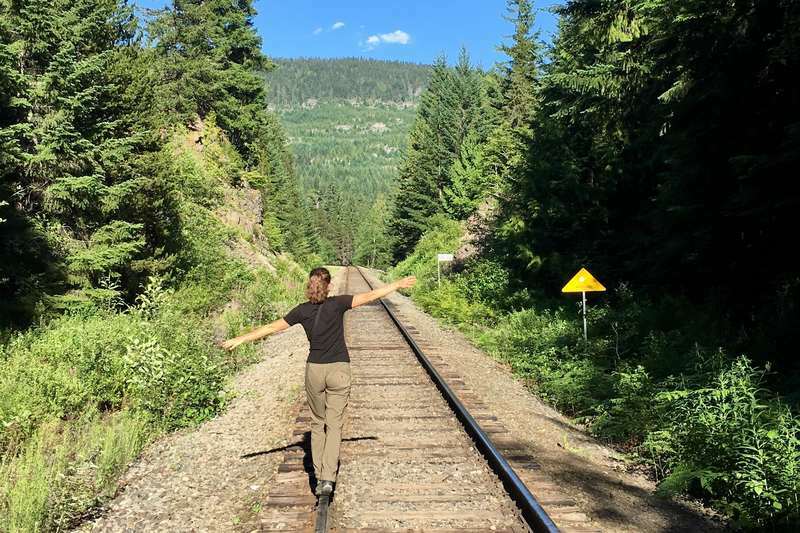 Traveling Canada by campervan: how much does it cost? 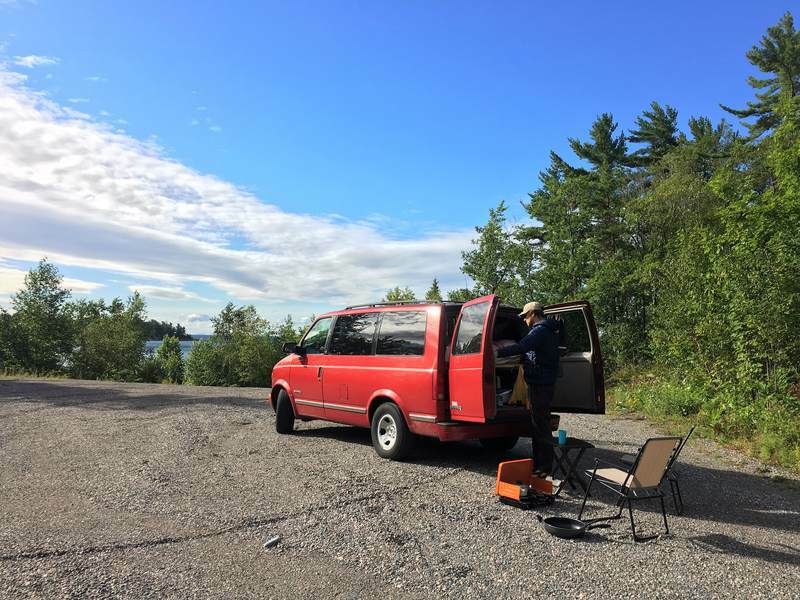 Because we planned to travel around Canada and the U.S.A. for an extended period of time, we decided to buy a van instead of renting a car or campervan. 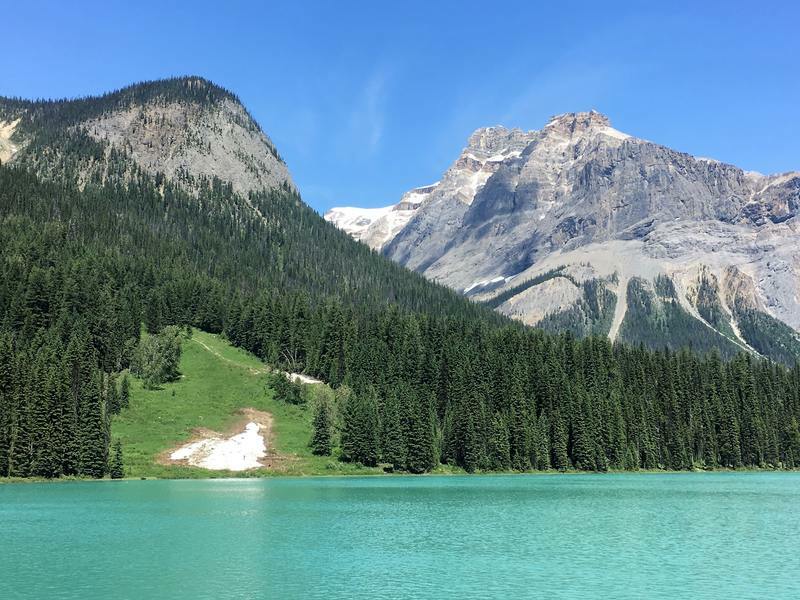 Check out my guide to buy a car in Canada as a tourist. This turned out to be a big money saver! Of course you have to be a bit lucky when buying a secondhand car, you never know if it will break down and how much it will cost to repair in that case. We were very lucky because our car only needed some small repairs along the way plus the regular oil changes. Keep in mind that buying and selling a vehicle takes time, therefore, I think it’s only worthwhile to buy a car if you plan on making an extended road trip (a.k.a. more than 6 weeks). Here is the detailed breakdown of all the money we spent on VANessa, our beautiful bright red GMC Safari (from the year 2000). 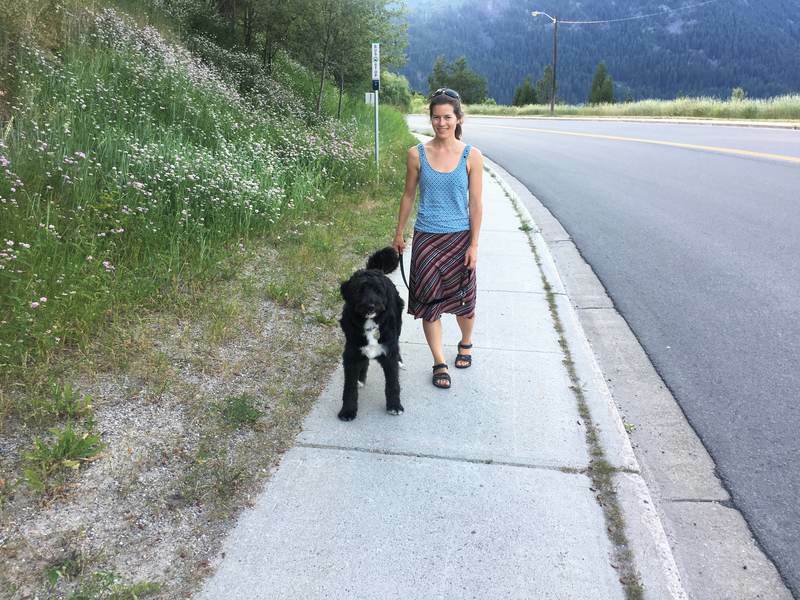 We drove 25.000 kilometer with VANessa, across Canada and back through the U.S.A. In total we were on the road for 141 days, which is why I divide the net costs by 141. The average daily costs for VANessa were €18/26 CAD. Petrol is relatively cheap in Canada, at least compared to the Netherlands. The downside is that American cars are not very fuel efficient… Our VANessa did 1 in 10 (liter per kilometer) on a good day (a.k.a. highway) but only 1 in 5 when driving in the city. In any case, since we did a lot of driving we also bought a lot of fuel. The average costs for petrol on a daily basis were €14/21 CAD. Depending on our location, we paid between 1,05 CAD (in Alberta, because it has oil sands) and 1,30 CAD (in Vancouver, because it’s an expensive city) per liter. We spent most nights of our Canada road trip in our comfy VANessa and found many nice campsites all across Canada! Most nights we choose to stay at free camp spots, however, some nights we looked for an official campsite to have access to a shower (or to do laundry). I recommend to download the iOverlander app to find (free) places to camp in Canada. Every once in a while we stayed at an Airbnb, mostly to catch up with family via proper internet or to have something delivered (it’s difficult to receive packages when you don’t have a permanent address;-). But also because, as much fun as it is to live in a van, every now and then it’s nice to be in a house with a kitchen, bathroom and more than 5m2 of living space. Finally, in big cities it’s more convenient to stay at an Airbnb as well, since there usually aren’t many places to park overnight. The easiest and most effective way to save money in Canada is by cooking your own food. 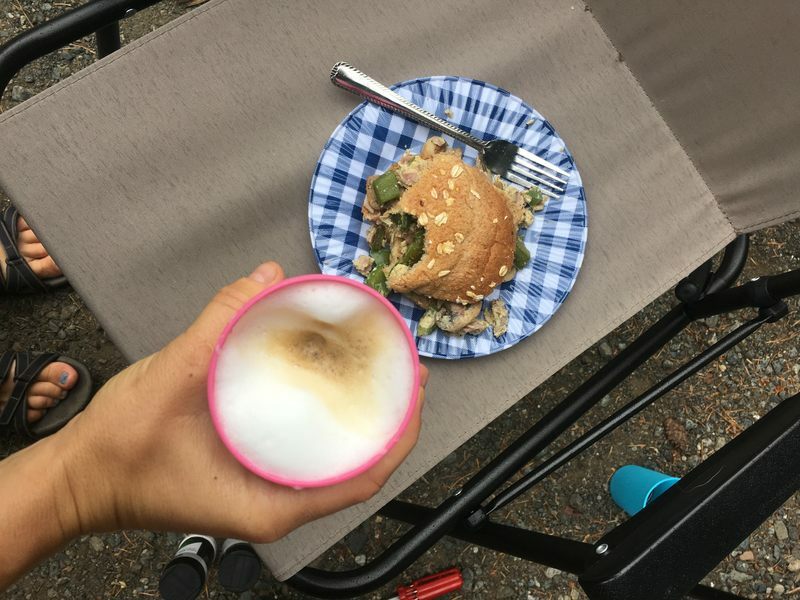 We made our own breakfast, coffee, lunch and dinner pretty much every day. Our average daily expenses for food and drinks were €24 / 36 CAD. 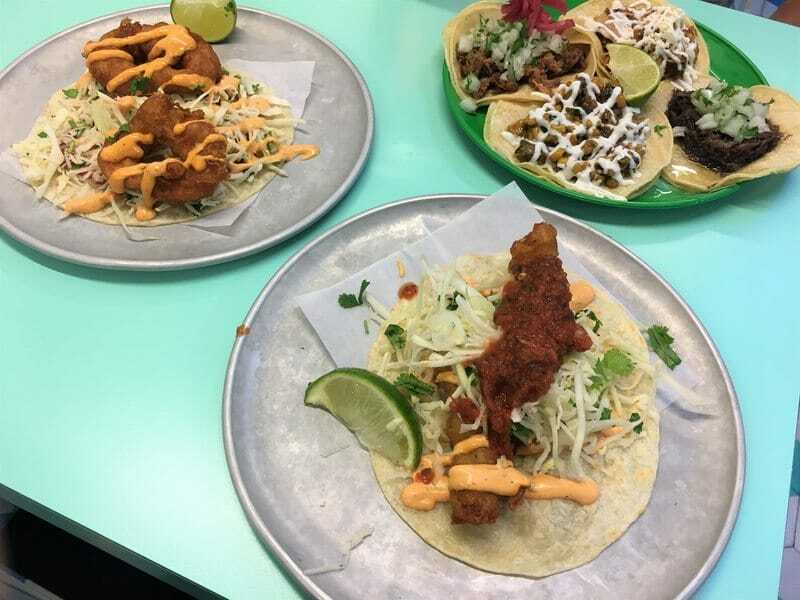 Or course we splurged every once in a while and ate out;-). 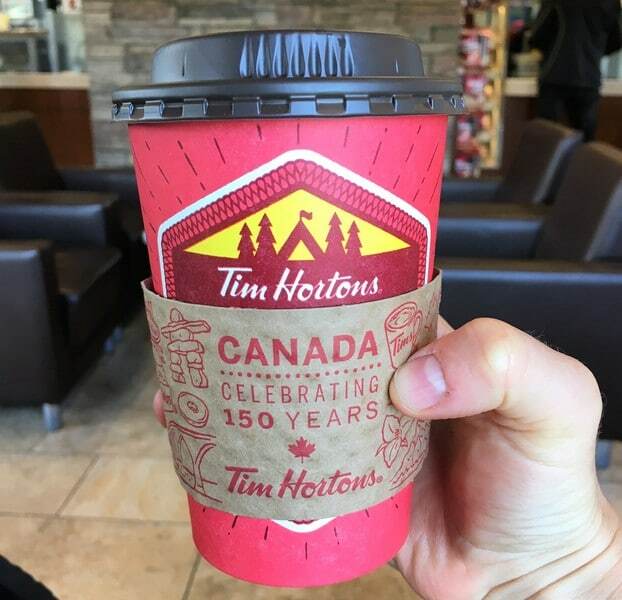 And most days we got a cup of coffee at the ultimately Canadian coffee chain Tim Hortons. Our activity costs and miscellaneous expenses in Canada were €3 / 4,50 CAD on an average day. We are avid hikers and I honestly have no idea how many hikes we did during our Canada road trip. Lets just say a lot;-) A big plus about hiking, besides being awesome, healthy and a great way to explore the area, is that it is also completely free! Therefore we didn’t spent a lot of money on activities on most days. Sightseeing in cities is also free (besides the occasional cup of coffee, ice-cream cone or museum ticket) and we had a great time checking out Vancouver, Victoria, Calgary and Winnipeg*. *Please note that I was hosted by Tourism Winnipeg and Travel Manitoba and didn’t pay for any of the activities mentioned in my Winnipeg post. Nevertheless, I always write an honest recount of my travel experiences, regardless of who is paying for it. This category is made up of some random expenses, things like laundry, public transport tickets in bigger cities (Vancouver and Calgary), a local SIM card, postcards for people at home, etc. There are thousands of free campsites all across Canada, you just have to know where to find them. Most camp/overnight spots we found via the iOverlander app. The app is free and includes comments from people who have (recently) visited a particular camp spot. We rarely had any issues finding a free camp spot or place to park for the night. Only in major tourist areas (like Banff and Jasper) there are ‘No overnight parking or camping’ signs, obviously you shouldn’t wild camp there and book into an official campsite instead. And as always, leave your campsite as clean (or cleaner) than you found it! Check out Trustedhousesitters for more information. To find cheap fuel we used the Gasbuddy app. This app (and website) shows the prices of petrol stations near you. There can be quite a big difference between them so it’s worth to look around for the cheapest option! Like I mentioned above, there is also a large difference in fuel prices between states and between the countryside and big cities. For example, Alberta has its own oil fields and fuel tends to be a lot cheaper there compared to other states. On the other hand, fuel is usually much more expensive in bigger cities (like Vancouver, especially at the gas stations downtown). That’s all our Canada expenses! 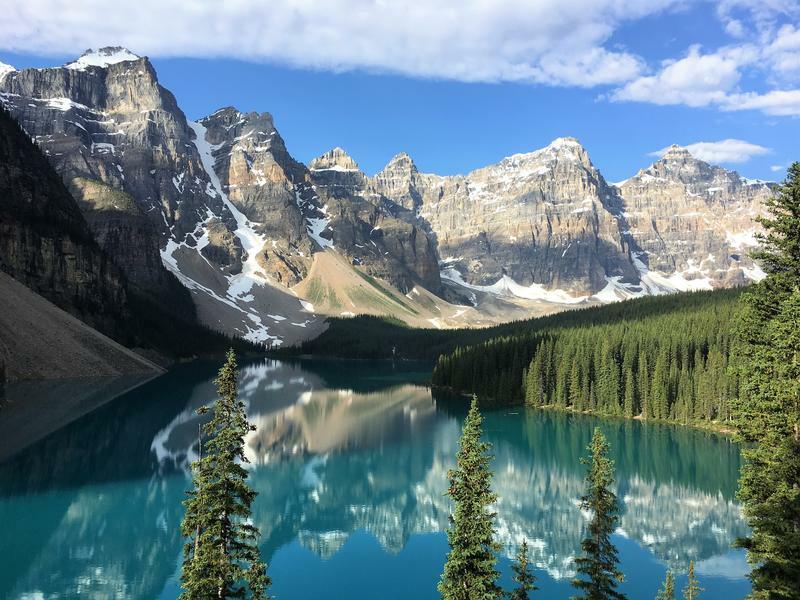 I hope this post has shown it’s possible to travel Canada on a budget and has inspired you to visit this beautiful country! Feel free to ask any questions you may have and enjoy planning your trip! Lottie well done I’m very excited to take a leap of faith and go travel myself to Canada in a few months. I’m currently in Darwin working as a nurse. I’m from the south of Ireland so let me know if your ever there my mom keeps Frisian horses and plenty dogs who are awesome. You could so visit Kerry and travel around there I’m sure you would love it. All the love and light to guide you. Thank you so much for your kind comment! I hope you have a great time to Canada:-) I made a short road trip around a part of Ireland in 2016 and felt our trip was way too short, there were so many beautiful places… I’ll definitely get in touch when we plan another Ireland trip! I’m stoked to hear that, Canada is absolutely amazing and you will not regret making a road trip there… The country is made for roadtripping and the people are supernice. Nature is phenomenal so who knows you might end up staying there;-) Though Ireland is beautiful too btw!